The Holiday Park is perfectly situated alongside the Wimmera River among the gum trees, with plenty of grass and accommodation options for your next stay. We have six cabins available, with all the basics you’ll need during your stay to ensure you will definitely be able to wind down and relax. Our new two bedroom cabins have arrived! 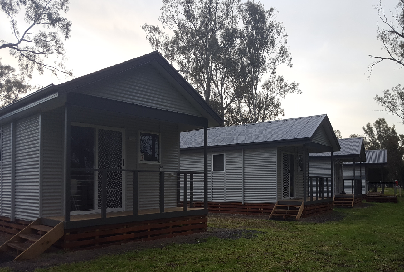 Our deluxe two bedroom cabins are luxurious while still being able to enjoy the peaceful atmoshpere and bush setting that Dimboola has to offer. We're in the business of creating happy memories, but don't take our word for it! See what our previous guest's our saying about us on TripAdvisor. After a very hot day travelling we had a very relaxing stay in Dimbooola. Beautiful park - green, clean and wonderful amentities on the banks of the Wimmmera River. Stayed over night on the way to Adelaide This park is right next to the river. Campsites are Nice & grassy even in summer. We stayed here over the March long weekend and loved it. The park is really beautiful ... lovely green grass, nice clean facilities, new camp kitchen etc and in a beautiful spot. Loved Dimboola and will revisit for next rowing regatta. 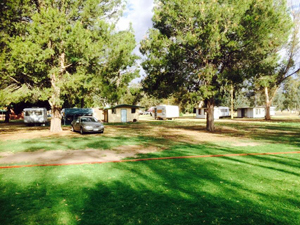 The caravan park is fantastic & is in a lovely position being on the Wimmera River and within walking distance of the town. 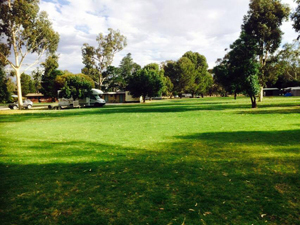 Have you stayed at Riverside Holiday Park Dimboola recently? Leave a review!